This article will help you to choose the most appropriate and effective cryptocurrency trading pair. Let’s take a look at the new indicators presented in a summary table if you click on the [Volatility Indicators] button of the tab menu on the left hand side of the user dashboard. 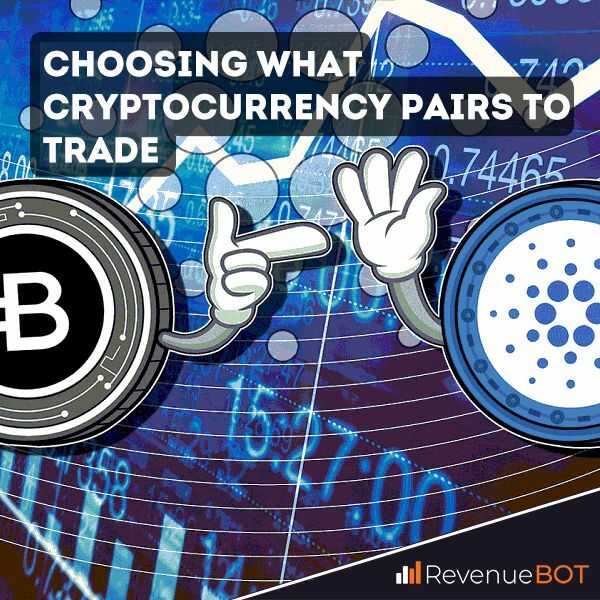 If you want to increase revenue from trading with RevenueBot, you should choose an appropriate trading pair with high volatility. We have calculated indicators of the volatility (RB indicators) for every trading pair present on cryptocurrency exchanges. Indicator of the volatility (RB indicator) – is the number of cryptocurrency oscillations on 0.5% for the specified time period (1, 3, 6, 24 hours) in 1 minute intervals. In addition to high volatility you should understand the possible risks of trading. You must also analyze trading signals and indicators for risk assessment. RSI indicator – is the most important indicator for determining trading pair risk. It reflects the trend power, ranges from 0 to 100. RSI signals when the cryptocurrency is oversold (<30) and when it is overbought (>70). Trade Pump/dump - is a defining attribute for risk assessment. Total trading volume over the last 24 hours and if there was pump/dump in the recent past – are defining attributes for risk assessment. The indicators mentioned above are made for integrated assessment of trading pair. And if you click on the [Volatility Indicators] tab of the menu on the left hand panel, the indicators are shown in a summary table to allow for integrated assessment of trading pairs. In cells of the [rb] columns you can see the percentage of the rise/fall in the price for the chosen period of time. Sorting the data of the selected field in descending order helps to determine high volatility trading pairs for the chosen period of time. 24hvolume - trading volume of the pair in the last 24 hours. Pump/Dump - shows if there was a pump/dump in the last 24 hours. You always can assess the volatility of your chosen trading pair or find another one based on the indicators we examined in this article. A concrete example: Which trading pair is better? By default, rows are sorted by column rb1h-1m, in order to show to the user the most volatile cryptocurrency pair during the last hour. 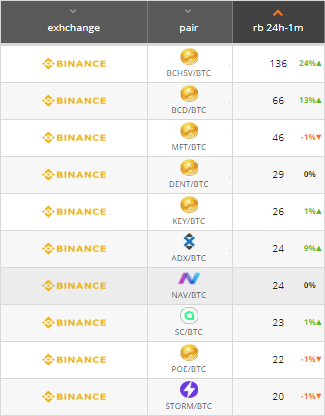 As you can see, pair BCHSV/BTC is in the first place with 8 oscillations (for 0.5%) in the last hour and 154 – in the last 24 hours. 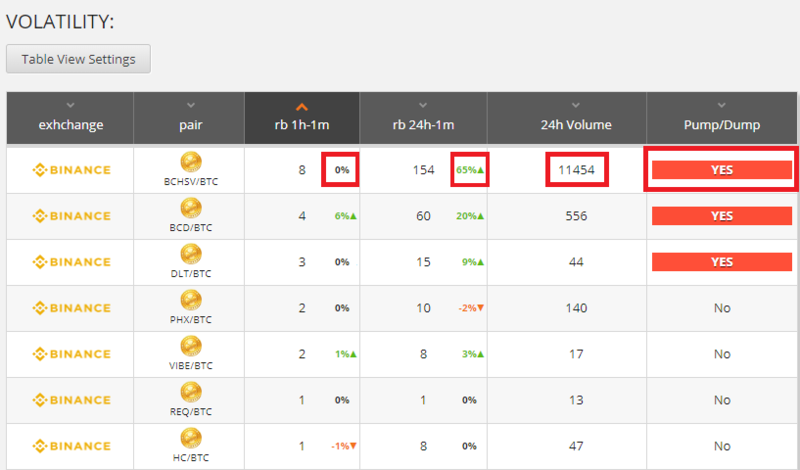 You can also see that trading volume reached 11454 BTC in the last 24 hours and the price increased by 65% in the last 24 hours, however, the increase in the price stopped in the last hour (you can see it’s 0%). Thus, if you take first 5-15 pairs from the table you will be able to find the best trading pair that fits your strategy. Some users prefer to not spend a great deal of time working with bot, and want to configure the bot once, and rarely monitor it to check the statistics. Such users will earn a smaller profit, but without big risk (it’s on average 0.2-0.7% to deposit per day). They must choose their trading pair very carefully, diagnosing all the risks. The cryptocurrency should not have frequent pumps/dumps, trading volume should be more than 100 BTC per day, and it shouldn’t be a little-known or new cryptocurrency. Don’t forget to configure filters to start the bots. We also recommend that you split the deposit into several reliable trading pairs and use non-aggressive settings for the order grids – ratecover ≤30% and profit <1%. Number of orders in each order grid and the martingale percentage (how much larger in volume each order in the grid will be than the order that was placed previous to it) need to be chosen on the basis of the deposit amount, because the minimum order amount is limited on cryptocurrency exchanges and it can be impossible to divide the deposit into 20-30 orders. Some users can spend a great deal of time working with the bot, controlling the trading, changing strategies, and reconfiguring. Such users are able to earn large profits. We recommend using the most volatile cryptocurrency pairs that you can trade for a profit, right here and now, until you have time for monitoring. And stop the trade if you leave your RevenueBot account. In this strategy you can use aggressive settings for the order matrix with rate cover ≤15%. Also, you can configure logarithmic distribution of the orders with a high ratio (>1.5) to receive a larger number of orders near the current price at the cryptocurrency exchange and activate more of the deposit amount in trading. Next PostNext Bot smart start. Create and manage filters. Bot smart start. Create and manage filters. Automated bot for smart trading on Binance, Bittrex, Bitfinex, Poloniex, Exmo, Livecoin, Cex.io, HitBTC, OKex.